Smokey the cat was very magnanimous this week. He refused to draw just one name. Instead, he drew three. So, Three Winners of Free Book Friday this week! Email me your top three choices and your address at brosam (at) gmail (dot) com. It all started when I was too impatient to wait for the elevator in a hotel. To speed things up, I shimmy down the hotel atrium on a line of bed sheets. Then the hotel security guys corner me, and threaten to kick me out of the hotel for such a bone-arse move. I say: "Don’t you know who I am? I’m Brodi Ashton." I proceed to dance for them, flailing my arms about, sorta like a banshee. But I can see this is not working. They don't know who I am. The chase is on. I dart into the hotel restaurant, but the dining area has one construction flaw. The only way in or out is to walk on top of the tables. I do this, apologizing all the way, and explaining to every diner that usually I get paid to dance on top of tables, and isn’t tonight their lucky night. I get to a hallway that leads to the elevators. But when the doors open, the inside car is 2 cubic feet. I squeeze in successfully, all except my right foot. So, naturally, I chop it off and hit the button that says ‘roof’ on it. A man is waiting for me on the roof, and as soon as I get off, he tells me I’m late, and ushers me to this amphitheater like that giant one in L.A. (Of course, I’m limping because of the missing appendage). I get on the stage, and I start dancing for the audience, balancing on the stubby bone protruding from my cankle, spinning around it like a whirling dervish on a top. My hair is long, thank goodness, because by this point all my clothes are gone. The conductor urges me to start singing, but when I open my mouth, a bug crawls out. Then another. Then another. Someone please interpret this dream for me. I honestly woke up thinking to myself Brodi, you are one seriously messed up chica. Thing 2. Acronyms for television shows. Thing 3. Expiration Dates for Canned Goods. I found a can of baked beans in my pantry the other day. Expiration date: Oct 2000. Now, since Oct 2000, we’ve lived in London, Washington, D.C., and Salt Lake City. Which means I must have carted this can around every time we moved. Which sounds about right, since I don’t remember buying baked beans. I don’t even liked baked beans. But Canned Goods should be eternal foods, shouldn’t they? Thing 4. Wobbly Tables at Restaurants. You know those tables that clank back and forth every time you put your elbows on top? Or reach for your drink? I had one of those tables at lunch yesterday. I kept folding up pieces of paper from my purse and shoving it underneath the platform on the floor, until it was floating on a bed of crumpled paper, but it never fixed the problem. So, what must go for you this week? Ok, first of all, I didn't realize Smokey was your actual cat. I thought you just found those pictures on the internet. I had a crazy dream last night too, involving lots of birds (and bird poop of course), a pig that was going to be butchered, plantation houses and big flouncy dresses, followed by mini-skirts. I also took cookies to the Parrs. Things that must go: My swollen, too huge, pregnant belly. Also my screaming toddler. I would replace them each with a cute sweet baby (that of course you can hold!) and a happy, TALKING version of my toddler. I believe Kim's the expert on dream analysis...but maybe take a moment first and ask yourself if you really want to know what the meaning of this dream is. Heather- Yeah, Smokey's a real cat, and he really was ours, and we gave him to my sister in law. People still don't believe me. My pregnancy dreams were whacked out too. I dreamed I gave birth to a squirrel, who then ran into the street and got hit by a car. Weird. Valynne- You're right. What if the dream means I'm a bad person? Or I'm guilty of manslaughter? What must go? What must go? Don't get me started. BTW - I am about 1/2 way through Shiver - LOVE IT! Send more of those my way!!!!! I'm running low again. Except, so far it seems Stephanie Meyer could sue this chic because...um...it kind of seems like her whole Jacob / Edward idea mixed together. Of course, I haven't gotten to the end yet but since her copyright was AFTER all the Twilight stuff it kind of discounts the creativity of the characters a bit, doesn't it? Cam- I kissed Smokey's cheek, and told him it was from you. He hissed appropriately. I'm glad you're loving Shiver. I agree it's very similar to S.M. 's books, but here's what I've been thinking lately about that. So are a lot of others that came before, and since Twilight. I sometimes think that because Twilight is so huge, we tend to think every element in there is the first time it's ever happened. I had a friend whose book had a scene in it where the two main characters are in a biology class together, and some of the feedback was, "you can't do that because it's too much like Twilight," when every Junior in High School takes Biology at some point, and it's a typical scene for YA books. Know what I mean? But I do think Shiver is popular in part because of its resemblance to Twilight. 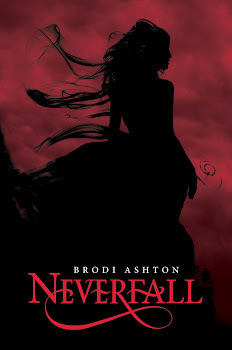 Girl meets boy, boy is supernatural creature, their love is doomed. You know that new show on WB Vampire Diaries? People were complaining it was a ripoff of Twilight. The books that the show was based off of were published a decade earlier. I don't know, what do you think? Are you thinking this is a totally too long comment to your comment? Too bad. It's a wednesday, and I have time on my hands. Britt- Hubby can't remember his dreams either. He is also grateful every morning when I tell him about my night. You have a point. It is unfortunate though that BECAUSE Twilight is so huge everything else will be compared to it. Not that I'm complaining - bring on the supernatural love - it's just unfortunate. Cherie - so, I'm an anxious, off-balance crazy chick. That sounds about right. Thanks for de-lurking! Cam-let me yhink about it and I'll compile a list. The Dark Divine hits stands in Dec. and it is definitely up your alley. Have you tried Graceling? Wicked Lovely? Anyone else have suggestions for Cam? I love how in dreams, chopping off your foot seems like a perfectly rational solution for getting it unstuck! Also, I think it was the Sioux Indians that believed that when you had a dream, it is symbolic of something that needs to happen in real life, or be acted out on a stage. But I personally think you are a bit loony. As for my thing that must go, it's gotta be mattresses that are too hard. FWIW Bro, don't mean to burst your bubble...but that wasn't a dream and that wasn't you. It was the latest episode of 'Fringe' and it was Anna Torv in it. And canned goods never go bad. I sure hope you didn't throw those away...I was hoping to have a steaming bowl of baked beans tonight. And yes, the 'A' stands for aardvarks. I love Smokey, he's so generous! I dream in full color - sometimes they are just as wild as yours, Brodi. Have you ever woken up and had to actually take the time to figure out if you were dreaming or really awake? My poor hubby got the cold shoulder one morning for a few hours until I realized the argument we had...was all just a dream!!! Luckily he loves me, craziness and all! After a mini-vacation, it was great to come back to three of your blogs Brodi, but it really icked to come back to work. Things that must go government forms, especially for RFPs! All that stress I lost on vacation, came back within ten minutes this morning! Heather - congrats on your coming baby! I'm preggo too and I agree, the huge belly must go! There's got to be an easier way, right?!? 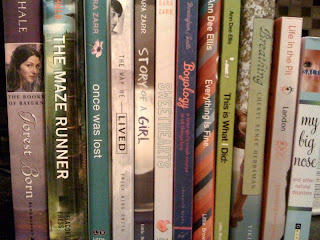 Cam - I'm an avid reader, I'm on shelfari, under the same name here, feel free to browse my shelf if you like. Lulabell- Loony. Is that the official Sioux diagnosis? Sam- FWIW? What does that mean? And if Anna Torv made it into any dream, it was yours. Don't deny it. Una- Down with RFP's. I don't know what they are, but if I see one, I'll beat it up for you. 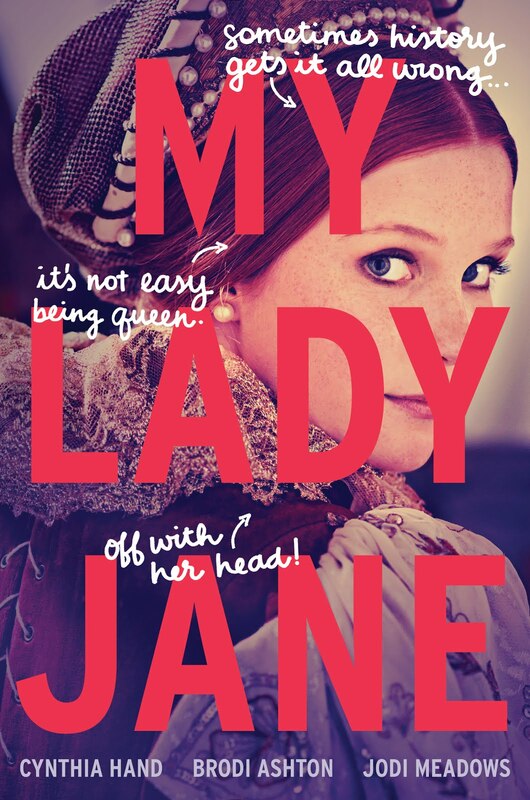 Everyone should be on Goodreads. Is everyone on goodreads? Wow! Smokey was very generous this time around. Brodi, had to come back and thank you. Because my neck has been out of place for 2 days, but somehow during the distraction of the dream interpretation it snapped back in to place. So, thanks! And of course, I'm on goodreads. Jenni- Smokey is very magnanimous. Sometimes he picks three, sometimes I have to bribe him with a virgin mouse just to pick one. You never know. And, um, sure. People must go. Had one of those weeks, huh? Cherie- Funny, because I almost became a chiropractor. I would love to take credit for actually eliminating a pain in the neck, instead of causing one. a) My grandma has food in her basement (tapioca pudding mix or cans) from like 1978. And we've gone through it at least twice that I know of but things like that keep showing up. b) When you woke up did your foot hurt? c)Signed up for Shelfari like 2 years ago. I need to get with the times and get on Goodreads! 2-I'm rereading Princess Bride. So lovely! A few I'm looking forward to reading soon (after I get a monkey of a project off my back) Fablehaven, Maze Runner, Jungle Crossing, Lemon Tart. a: You should see my mom's pantry. b:Now that you mention it, my right foot has been bugging me for about 3 months now, and that's the foot I chopped off! We once found boullion (sp?) in my grandma's cupboard that expired BEFORE MY DAD LEFT ON HIS MISSION. Yikes. Speaking of Anna Torv, 'cause someone was, hubby and I are watching Fringe (season 1 on dvd). Can't decide if we like it. She'd be prettier if she'd wipe that disgusted look off her face once in a while. And Pacey, I mean Peter, has all the good lines. Totally on Goodreads. Not sure how I lived without it. Okay, last year I stopped watching Fringe after a few episodes, and then I didn't watch again until the first season was out on dvd. Once I was about half way through, I couldn't get enough! Suddenly I love Pacey, and even Anna. We just barely finished season one, and are starting season 2. Give it a chance, and let me know what you think. I'm trying to stick with it. Husband is quickly getting annoyed... and we're only on disc 3. Yeah, it's been one of those weeks. Well, months really. I love that Smokey is so magnanimous. He's great. I also think he's cute. I know most people think his breed is hideous, but I could never think any cat is hideous. Is it true that his breed is good for people who are allergic to cats? I agree with you about comparing everything to Twilight. The only thing I ever compare to Twilight is the feelings I had when I first read Twilight because that feeling is the feeling that got me reading as much as I do. And, if a book gives me that same feeling, then I think the book I'm reading is awesome. But, as far as the story is concerned, sure there may be some similarities like you said (girl meets boy, boy is supernatural being, their love is doomed), but there are so many stories like that and that came out before Twilight. So, I think there is a little too much comparison. Debbie, you can export your books on Shelfari and upload them to Goodreads. That's what I did. It made things go by a lot faster! well i think i must have chopped off BOTH my feet (if your dream interpreter has it right!) in a recent dream. or is that real life where my feet are missing? i only understand about 1 out of every 100 of them when my kids text me (and by the time it takes me 20 minutes to answer their texts and ask WTF*(*freak) they meant...they have sent me 20 more texts. Jenni- I'm sorry about your month. I know how those go. 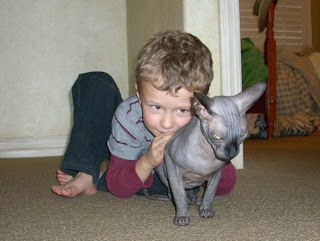 No, hairless cats are not good for the allergies, as I learned the hard way. I'm glad Twilight gave you a love of reading. A valuable gift! Dorien- but with both feet gone, doesn't that make you balanced? btw, I saw you today, and I can confirm you had both your feet. btw, btw stands for by the way. Brodi - I'm only on shelfari, but I'm sure it is only a matter of time before I am on goodreads. I never thought I would be on facebook and yet, I have one now. I don't know why people compare books like that. I know I don't, but I like to judge a book by itself, by it's own merits. I've read some other series that others said are like this or like that, but sometimes I don't see it or I can see a similarity but the differences make it, lemme think here....different from the other. It's all about do you enjoy the book... *sighs* I'll stop ranting. Oh, and thank you...RFP = Request for Proposal...sorry, I sometimes forget that not all acronyms are universal! Go for Goodreads! Although, I have to confess, I use it for other people's opinions, but I rarely rate any books. I'm sorta lame.